In a country dedicated to the practice of voodoo where an estimated 80% of the population live in poverty, Haiti Children's Rescue Mission (HCRM) is a light of hope in a place of spiritual and emotional darkness. Child slavery, rampant sexual abuse and exploitation and other horrors are all too prevalent in a country where parents who cannot afford to feed their family sometimes resort to selling their children into bonded slavery or turn them out onto the streets to beg and fend for themselves. HCRM is a place of refuge and hope as children in their care live in a safe home, receive an education and have an opportunity to be adopted by loving and caring families. All this happens in an environment where the love of Jesus is lived out by the staff and experienced first hand by each child. The orphanage is currently housed in rented facilities but HCRM has now purchased an undeveloped property on which they hope to build a permanent home, one that can accommodate more children and be more affordable to maintain in the long run. From February 13th to the 22nd, I will be leading an eMi team of two architects, a site planner, three engineers, a draftsman and two engineering students (one an eMi intern) to help design the facilities and infrastructure (power, water, sanitation) for the new property. Also coming is a volunteer photographer/artist/writer who will help to produce fund-raising and awareness documents for the orphanage as it continues to fund-raise for the construction project as well as its many ongoing expenses. We would welcome you to pray for our team: for travel safety, sensitivity to the needs of the orphanage, flexibility and grace in working together toward a common goal and an openness to love all the people we will be there to serve. Please also pray for my family and the families of all volunteers as they sacrifice time with their loved ones and fill the void in the busyness of family life at home. You can see more details of the project by clicking the link under Upcoming Projects at the top of the side bar of my blog. 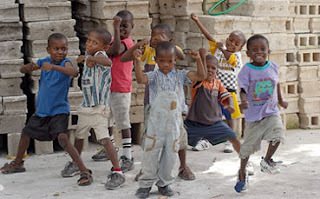 You can also visit the HCRM website at www.ourchildreninhaiti.org. Thank you to all our supporters and friends who have come alongside my family and me in so many different ways, making it possible for me to be a part of this work. I have received word that Pastor, his family and all the children are fine. They all slept outside last evening. We are so thankful for the news of their safety! But please continue to pray for them because now the task of obtaining fresh water and food will be a greater challenge than ever. It will also be hard to not know the structural integrity of their rented home and therefore they may be without shelter for some time. eMi is preparing several small first response teams to leave for Haiti in the next few days.